Responding to a public backlash against the idea of charging voters $70 to hear three Democratic candidates for Montgomery County Executive debate on November 15, event co-sponsor Bethesda Magazine announced on its website yesterday morning that the entry fee would be waived, and the debate open to the public. But Republican candidate Robin Ficker, who remains excluded from the debate, questions why the forum's other sponsor is still charging the $70 admission fee on their website. 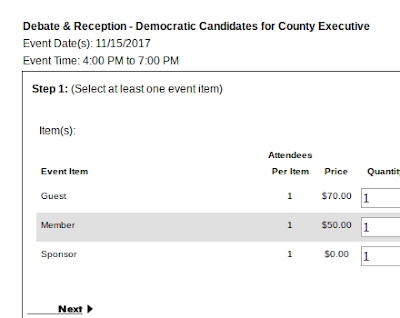 As of press time, the debate ticket order form on the Greater Bethesda Chamber of Commerce website still shows admission charges for members and non-members of the Chamber. It's possible that people are still buying tickets without knowing the event is now free. Ficker and others continue to press for his inclusion in the debate. A non-profit hosting a debate that promotes only one of the several political parties active in the County raises some questions. Organizations with tax exemptions cannot endorse candidates or parties unless the expenditures are through a separate political action committee. The Chamber has operated such PAC in the past, but it is not listed as the sponsor of this debate. Another reason Republicans are wary of Ficker's exclusion is that, in heavily-blue Montgomery County, few debates are held after the primaries. Republican, Green Party, Libertarian and independent candidates are given few public forums to reach voters then, and so it is urgent that organizations include them in primary season debates.